So Fresh Entertainment was established in April 2011. Based in a small rural village in Co. Kildare called Allenwood but providing a huge range of wedding related services across the whole of Ireland. So Fresh Entertainment was founded and is managed by Damien Coyne. Damien is a full time professional wedding DJ specialising in full night DJ gigs for weddings. Alongside his wedding DJ services, Damien has diversified into other areas of entertainment perfect for the wedding industry. Always one to spot trends early in the industry Damien was one of the first suppliers in the country to bring in LED Sparkle Dancefloors way back in 2013. So Fresh Entertainment is now the largest supplier of fully wired LED Sparkle Dancefloors in the country. From start to finish, the service Damien and his so fresh entertainment team provided us was excellent. Damien was the DJ for our wedding and we also hired the giant love letters. He regularly contacted us to ensure the songs which were played on the night were exactly what we wanted and to ensure the whole night went smoothly. The night itself was amazing the dance floor was packed from start to finish and as a couple getting married this is one of your major worries and to not have to think about this once was great thanks to Damien. As well as the service the price was very good and great value for money. I would not hesitate in the slightest recommending Damien to a friend or family. Best of luck in the future Damien! Damien at so fresh is one if the best suppliers in the business. Extremely professional and makes everything about the bride and groom. His equipment is second to none. Damien made my wedding extra special because of everything his does for the couple he goes above and beyond for your needs. 100% recommend booking him. 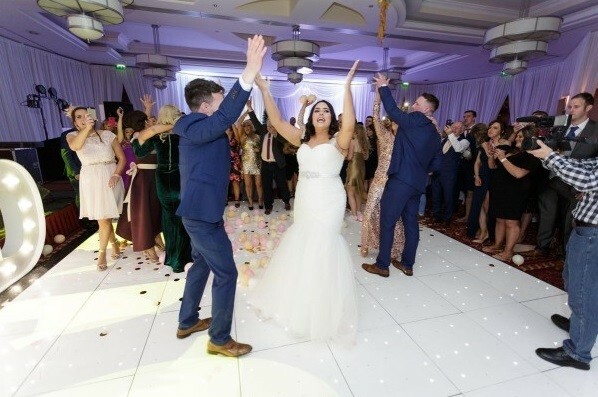 Could not fault anything in the service we received from So Fresh Entertainment, from meetings prior to the wedding to last minute changes, Damien made us feel like we didn’t need to worry about a thing, and we didn’t have to! The lighting was top notch and the dance floor was full all night! All props were we hired were fantastic!! We had Damien from so fresh entertainment look after us for our summer wedding last June. He provided us with a beautiful fairly lit LED dance floor, our initials in giant LED letters, a beautiful monogram which I loved so much. He also provided a wedding games corner which proved to be a massive hit with the children and adults, a photo booth that our guests had so much fun in and Damien provided us with a wonderful photo book keepsake with beautiful messages from our guests! The room just looked magical on the day we were blown away by Damien’s attention to detail, professionalism and his passion to make everything as perfect as he possibly could for us shone through and we are forever grateful. We would not hesitate to 100% recommend so fresh entertainment to any future bride/groom. Thanks again Damien & so fresh entertainment team. We would highly recommend Damien and the team from So Fresh Entertainment, They really went above and beyond to make everything perfect for our day. They supplied us with after band DJ, (Damien himself on the decks our guests really never left the floor all night ) LED dancefloor, monogram, He met us before hand to discuss music and placement of LED dance floor and monogram. The quality of this companies LED dancefloor was unbelievable to anything else we seen when looking, So fresh entertainment deserves 5 stars for professionalism, value for money and quality. Great team and made planning a wedding that bit easier! Thank you Damien and Team! So Fresh entertainment looked after our wedding I bc December. Damian was a pleasure to deal with and extremely professional. He was also dj on the night, people never left the floor due to a range of music that appealed to all. Also we had a photo booth. The quality of service was outstanding with another member of the team looking after this all night. They are so easy to deal with and nothing is ever too much of a hassle. At the end of the night we were also presented with an album of all the pictures from the booth. A wonderful gesture. I could not recommend So fresh entertainment enough. 5 star service and wonderfully priced. When planning our wedding we decided to go DJ only for the full night with no band, for us it felt like a big risk but thankfully a risk that paid off massively with Damien as our DJ. What can I say...we met with Damien a few weeks before our wedding to go through some of the music that we wanted played but to be honest apart from a few requests we left it in his capable hands! And he didn't disappoint. Our dance floor was full from the moment he started right until the end! After the day it was up there with one of the most talked about memories of our day and even still my guests always comment on the DJ! So thank you Damien for making our day and I would highly recommend to anyone!!! Damien supplied many items for our wedding including led dance floor, room up-lighting, room decor and Dj service. Damien was very professional to deal with and helped us out in many ways by going beyond our expectations. Could not recommend enough! For our wedding Damien was our Dj for the the whole evening he had everyone on the dance floor and played for every age, nothing was too much to ask for with Damien he was a pleasure to deal with. We also had the sparkle dance floor, the Ferraro Roche pyramid, candy cart and up lighting the venue looked amazing when he was finished, I would highly recommend so fresh to anyone getting married. Tell us about your experience with this supplier.